Welcome to the first edition of our "Birding at The Woodlands" blog series! Resident birding expert, "Toribird" will be reporting on recent birding news happening at The Woodlands over the next few months. Stay tuned for updates all things zines, birds, and of course, TORIBIRD! I (Victoria, "Toribird") have spent the last couple months working on a zine-guide to birds of The Woodlands. I got my start here when Jessica Baumert and I teamed up to catch an escaped parakeet. During the hours-long process, Jessica realized that I love birds and birding, and I was offered an internship at The Woodlands. Toribird (left) with zine illustrator Jess Ruggiero (right) at the Zine Release Party. The zine was one of a few birding projects that I have worked on here. We began with birding tips shared on our blog. Then, I led two bird walks and taught how to make pinecone-bird feeders on Halloween Family Fun Day. I also led a lantern-lit walk on the Winter Solstice. Just recently, on the evening of May 22nd, my zine had its launch party. The illustrator, Jess Ruggiero attended, and I really enjoyed getting to meet her! As part of the festivities, I led two bird walks. Jess went along for one, and she seemed very exited to see the birds that she had spent so much time drawing; I liked sharing them with her. Despite rain threatening, a nice group showed up. They were an interested, supportive, group and a pleasure to lead on the walks! All in all, I had lots of fun chatting and sharing what I knew, and I think all our visitors had fun too! If you're interested in purchasing a copy of the Guide to Birding at The Woodlands Zine, you can pick one up for $5 at an upcoming Woodlands Event. You can also donate $5 to The Woodlands and have a copy mailed to you. Donations can be made here. Spring migration is pretty much over. However, this means that each and every one of our summer residents are here. Some examples of birds that have returned are Ruby-throated Hummingbird, Northern Rough-winged Swallow, Grey Catbird, Yellow Warbler, and Chipping Sparrow. These birds are all common at The Woodlands during the warmer months of the year. See if you can spot them! Additionally, many songbirds are building nests and laying eggs right now. If you see a bird carrying rope, mud, grass, or other materials, you can know that it is busy constructing a cozy nest. Follow it and try to find their nest! Also, several birds are singing to attract a mate and defend their territory, though not as many as earlier in the year. Soon, you will be able to see this year's hatchlings. American Robin resting its wings on a headstone at The Woodlands. Photo by Toribird. Looking for even more birding fun? Find out which type of bird YOU are based on your personality with my quiz. You can take the quiz here. William Bartram's reputation as a botanist, naturalist, and explorer has endured in the modern world largely due to his single, classic book: Travels through North & South Carolina, Georgia, East & West Florida, the Cherokee Country, the Extensive Territories of the Muscogulges, or Creek Confederacy, and the Country of the Chactaws… Printed by James & Johnson, Philadelphia, 1791. William Hamilton had an extensive library and owned at least two copies of the book authored by his friend. One of his copies is now housed at the Sterling Morton Library at the Morton Arboretum in Lisle, IL and offers an interesting glimpse into the naturalist's library. In vivid text, Travels recounts Bartram’s southern explorations from 1773 to 1776, and documents his encounters with the natural world and with the native and colonial inhabitants of the English colonies along the Southern Atlantic and Gulf coasts. Bartram’s descriptions of Florida and the South captured readers internationally during his life and the book continues to be read widely in modern times. Bartram’s Travels was an unprecedented mix of literary genres—part travel book, part scientific record and description — a romantic narrative, an ethnography of Southern native peoples, and an exposition by Bartram on natural and theological philosophy. The publication of Travels in Philadelphia in the 1790s was an expensive undertaking. A large book, running over 522 text pages with an additional introduction, the original edition included illustrations and a map by William Bartram. It took two subscription efforts to get the book to print, in what was a risky publishing effort in post-revolution Philadelphia. The first subscription effort for the book in 1786, by the Quaker printer Enoch Story, Jr. failed, perhaps for financial reasons, but also in part because William Bartram suffered a life-threatening fall and compound fracture at the ankle while gathering bald cypress seeds at Bartram’s Garden in fall 1786. It took over a year for Bartram to recover. A second broader national subscription for Travels in 1790 by the new firm of Joseph James & Benjamin Johnson in Philadelphia succeeding in seeing the book to print in summer 1791. It has recently been discovered that Bartram’s Travels was issued in Philadelphia in more than one version. The standard version distributed to most subscribers had frontispiece, map and 7 illustrations. In early 1792 retail copies were also offered for sale with the option of “extra Plates, (eight in number)… either plain or coloured.” These extra plates were larger in size and were folded in thirds to be bound in the book. Currently only 5 sets of these extra illustrations are known. So far no trace of this first Hamilton owned copy of Bartram’s Travels has surfaced. A second, fine copy of Travels, with the standard plates colored, and bound with the 8 extra plates colored was presented by William Bartram to William Hamilton in 1799. This presentation copy from 1799 is now owned by the Sterling Morton Library at the Morton Arboretum, Lisle, IL. The Hamilton extra-illustrated copy of Travels, contains a rare copy of William Hamilton’s bookplate under the front cover, engraved with the Hamilton family arms and “W. Hamilton.” William Hamilton was certainly a collector of books, as well as plants, art, statuary and more. Recent research by Villanova students turned up a dozen volumes in Philadelphia area special collections libraries with the Hamilton bookplate or signature. But Hamilton likely owned dozens or even hundreds of volumes on botany, gardening and natural history. One book signed and with the W. Hamilton bookplate is now part of a collection of Bartram family books donated to the Historical Society of Pennsylvania in the 1890s by a Bartram descendant. That book. Thomas Martyn, The language of botany…, London: 1796 is a standard dictionary of botanic terms in English. It was probably loaned to William Bartram or another Bartram family member and never returned to Hamilton. The title page is signed by Hamilton on the upper right; “W. Hamilton’s Book give to him by the Author, June 9th, 1799.” No other documentation about this gift from William Bartram to William Hamilton survives. It may be Hamilton had lost or loaned his original copy of Travels, or he may have wanted an additional copy with the rare extra engraved plates? It is clear that William Hamilton closely read this copy of Travels, as there are small annotations on several pages – including the addition of the scientific names “Gordonia Franklini” and “Pinckneya” on page 16, where the description of Franklinia was printed facing the two folded extra-illustrations of “Franklinia alatamaha” and “Bignonia bracteata” [modern Pinckneya bracteata, or fevertree]. Other notes by Hamilton in his extra-illustrated copy of Travels also comment or annotate some of the rarest plants that William Bartram encountered in his trip. And of course there is evidence that Hamilton was growing some of William Bartram’s southern plant discoveries in the garden at The Woodlands. One of the seed packets recently recovered from the attic of The Woodlands was labeled “Hydrangea quercifolia, Bartram’s Travels” and oakleaf hydrangea was another new plant described and illustrated by Bartram in the book. Hamilton's inscriptions are telling; he only made notations in the botanic sections of Travels, indicating little interest in sections dealing with birds and wildlife, or in the parts dealing with Native peoples — the Creek, Seminole, and Cherokee. A group of scholars, including Nancy Hoffmann, Bill Cahill, Alina Josan and Joel Fry, are currently working to research and locate copies of the 1791 edition of William Bartram’s Travels, collating a census of copies, and looking for owner’s names, annotations, binding, and general history. The researchers have located over 125 copies, mainly in special collections libraries in the US, and have visited 56 or more copies. Many or most of the copies seem to be subscription copies, and a third or more have a similar original binding. Many of the owners who signed copies were substantial citizens in the early U.S, and local lending libraries around Philadelphia also held a number of copies. Only four are now know bound with the extra plates seen in William Hamilton’s copy at the Morton Arboretum. As of yet, the researchers don’t have a firm knowledge of how many copies of the 1791 Philadelphia edition were printed, but they estimate that it might be on the order of 400 or 500 total. The lasting fame of Travels is probably due to the widespread European reprints of the book, which began to appear in 1792, a year after the Philadelphia printing. There were English editions of Travels in London in 1792 and 1794, Dublin: 1793; translations into German with editions in Berlin and Vienna: 1793; a Dutch translated edition in Haarlem, 1794-1797; and French translated editions from Paris: 1799 and 1801. These European editions were all based on the 1791 subscription version and copied the standard illustrations, but never included the 8 extra plates. Stay tuned as we highlight more of the fascinating botanical connections between these two sites! “Why did someone build a house in the cemetery?” It’s a question I’ve heard more than once as I’ve volunteered at a Woodlands event or walked through the cemetery with friends. When it came time for me to teach a public history practicum for graduate students in History at Villanova University, I decided to use this common misreading of the landscape as a starting point. The cemetery was, in fact, created in 1840 to preserve the estate of William Hamilton as green space in urbanizing West Philadelphia. I charged my students with designing and executing a class project that would make the eighteenth-century history of the site legible to listeners who frequent the site and to ones who might never visit. So in January of this year, my students set out to design, research, write, and produce a podcast series that explored the history of The Woodlands before it became a cemetery. In the first three weeks of class, we laid the intellectual groundwork for three key components of our project. First, we read published scholarship and unpublished research files about the Hamilton family and The Woodlands to orient ourselves in site-specific histories. Second, we read scholarship about doing history with, and for, public audiences. We also assessed The Woodlands master plan and met with Jessica Baumert to discuss her leadership goals and current uses of the site. Third, we studied the elements of Dr. Covart’s podcast episodes and dipped into ongoing conversations about how podcasting can be good scholarship. Best of all, Dr. Covart joined us on campus for a workshop! And then: we became podcasters. Each student wrote and produced an episode. But we worked as a team to write a single intro, select and edit music, and build a shared architecture for each episode – including the segment “Primary Exposure,” which focuses on how historians use evidence to analyze the past. It quickly became clear in defining these elements that we wanted to share the process of doing history with our listeners just as much as we wanted to share knowledge about The Woodlands. 1. A good podcast depends on good history. Right after students submitted their final sound files, one student said, “I hope listeners don’t think we just turned on the microphone and started talking.” I assured him that their podcasts gave listeners plenty of clues to the depth of work that went into the final product. Each student wrote a podcast script that upholds academic standards of evidence, analysis, and citation. Students worked with peers and with me to edit these scripts heavily before recording. Without good content, all of the work of recording and audio editing would be meaningless. 2. Good history depends on collaboration. We did not do this project alone. Our podcast website thanks a number of people who provided support specifically for the recording of our podcasts. Yet our research also built on work done by previous researchers, historians, architectural scholars, and archaeologists. Podcasters walked a fine line as they worked to keep podcasts listenable while also crediting the work of the scholars that they engaged. Links to key books and documents in each episode’s show notes include only a few sources that informed the podcasts. We hope that our work can be a resource for future work as well. 3. Good history participates in ongoing conversations. Historians working in public and academia hold this as a core value. We aimed to design podcasts informed not only by our perspectives as historians but also by our assessment of The Woodlands’ strategic plan, the activities of current users, and issues that might interest neighborhood residents not yet engaged with The Woodlands. We also felt that it was important to get listener feedback at public events and online to think about how to improve the podcasts and select topics for future programs and historic research. I am very proud of the work that these students have done this semester, and we are all very excited to share it with you. We welcome your feedback at our public event on Wed., April 25, 5:30-7:30 p.m., at the Go West Craft Fest on Sat., Apr. 28., or as a comment on this blog post. Happy listening! About the author: Dr. Whitney Martinko is an assistant professor of History at Villanova University. She lives in the Cedar Park neighborhood of West Philly and has volunteered at The Woodlands since 2013. Did you know that William Hamilton of The Woodlands and William Bartram of Bartram's Garden were contemporaries and friends? The two shared a love of plant collecting and botany, were neighbors, and were involved in many of the same local institutions! To highlight some of these lesser-known connections, we're bringing you Two Williams: a six month blog series hosted between The Woodlands and Bartram's Garden. Each month, we will dig into the archives and share what we find! Uncommon for someone of his wealth and status, William Hamilton of The Woodlands left relatively little evidence of his life behind. Unlike William Bartram, who devotedly documented his work (in elegant prose, no less!) much of what we know about Hamilton’s plant collection and the design of his estate is through a small selection of personal letters and visitor accounts. With no direct heirs, most of Hamilton’s personal effects, art, and furniture collection were gradually dispersed with the estate. Today, the few known collections of personal letters and accounts are located in various repositories and archives around Philadelphia. Though this means that researching Hamilton can be a challenge, it also makes new discoveries more exciting because you never know where or when you might find them. Thanks to a hungry group of rodents and a meticulous historian, an unexpected discovery was made in the attic of The Woodlands that revealed quite a bit about Hamilton’s plant collection. In the early 1990’s, as architectural historian Tim Long poked around some of the unfinished sections of the attic while examining the framing structure of The Woodlands mansion, he noticed small terra cotta fragments strewn throughout, which he as able to identify as bits of small, hand-thrown starter pots used to sprout seeds. With a more discerning eye, he reexamined the floor and began to make out the edges of dozens of rectangular pieces of paper, caked beneath a thick layer of dust, resting between the floor joists. After carefully gathering some samples, Long identified the flimsy objects as historic seed packets, based on similar ones he had seen on display years earlier at Bartram’s Garden. These once ubiquitous, hand-folded packets were generally 6-sided and distinguished by a self-locking folding technique, which produces triangular ends. Long collected the packets and they were eventually placed on loan in the botany department of The Academy of Natural Sciences for safekeeping and to allow for further study. 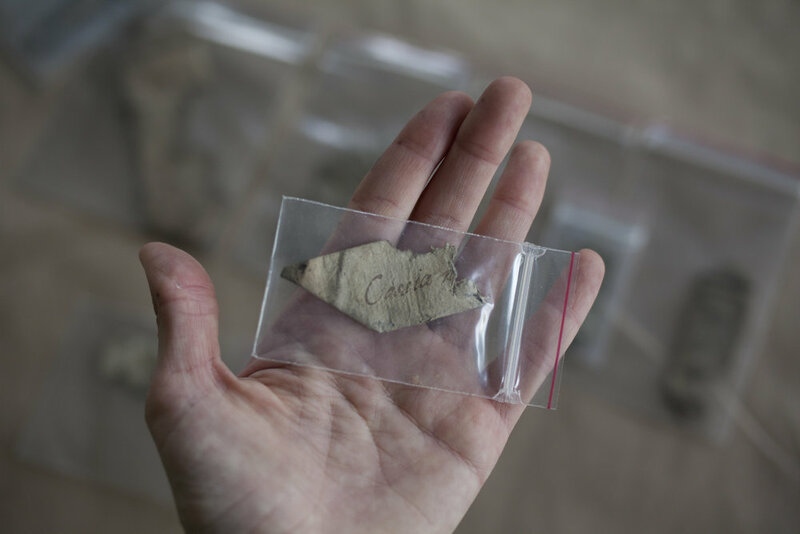 The folded packets were created from a variety of papers in a variety of sizes, and were carefully inscribed in cursive with Linnaean binomials. 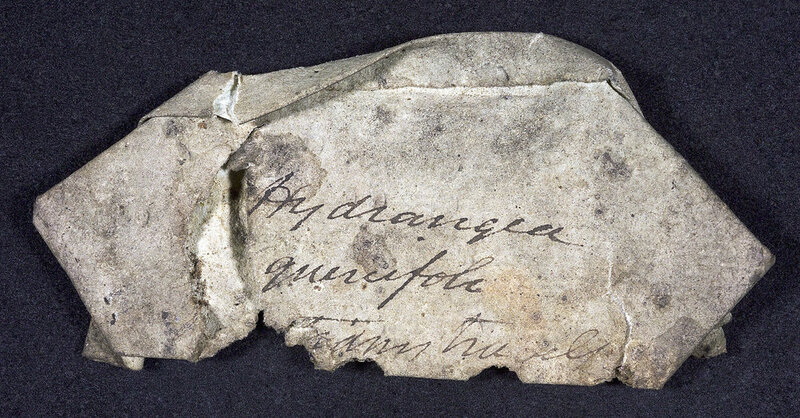 Some packets also included botanical authorities, along with dates or personalized notes related to their contents. As Bartram’s Garden Curator Joel Fry, who analyzed and catalogued all 250+ examples says, this was a “rodent-selected sample,” which probably means that hungry critters were pulling packets with edible or tasty seeds from a box or boxes left in the attic for storage. Consequently, most of the packets and their contents had been liberally gnawed, making the labels a little more challenging to decipher. In 2007, Fry transcribed and catalogued the collection, translating the historic plant names from the packets into modern scientific binomials, transcribing notes, and where possible identifying the label writers. The majority of the packets were written by an unidentified writer, which Fry suspects may have been a professional clerk or scribe, due to the stylized nature of the handwriting and apparent skill of the calligraphy. He notes that the handwriting differs from the typical style of writing common in Philadelphia around 1800. Packets inscribed by “the X writer” (so-named by Fry because of the way the writer’s r’s resembled the letter x) may have originated somewhere in Europe, or were at least inscribed by a writer trained there. William Hamilton labeled a third of the collection himself (87 packets), a detail that Fry believes speaks to his proficiency in botanical science—it would have been rare at that time for people to know the correct scientific names for such a wide variety of plants. As Fry points out: if you were to randomly select people off the street today, how many could come up with the Latin names for any plant, let alone dozens of them? Hamilton even went as far as to supply multiple Latin names on a few of the packets, a detail that Fry says indicates he was privy to contemporary controversies in plant naming conventions. A handful of packets appear to be labeled by different unidentified writers. At least one packet was labeled by neighbor William Bartram. Some of the species represented in the collection were North American native species that the Bartrams first collected and grew, which William Hamilton likely acquired from William Bartram and the Bartram family garden. The collection of plants represented by the packets consists of a wide-ranging mix of plant species and types. Comprised mostly of relatively small seeds, the collection is skewed towards herbaceous plants — non-woody perennials, biennials, and annuals, but there were also some woody plants represented. Though there are some native plants in the collection, most of the plant species represented are exotics from a variety of provenances around the globe, which were also often denoted on the packets. The majority are considered to be outdoor plants—including edible varieties—and things that wouldn’t be uncommon to find in a kitchen or flower garden, as opposed to temperature-sensitive tropical greenhouse plants. An expert historian like Fry can also read into some of the more specific details hidden within the collection. He points out that the abundance of hibiscus or mallow family plants (the Linnaean “Monadelphia Class” which included tea, cotton, okra, camellia, and the Bartrams’ Franklinia among others) indicates Hamilton was tuned in to important scientific developments and trends of the time. A prominent Spanish botanist, Antonio José Cavanilles (1745-1804), had been publishing a series of dissertations on this plant group at the end of the 18th century, and the “Monadelphia” were also the subject of significant research in Paris. The Woodlands seed packets include several “economic plants” imported from India, Asia, and Africa that align with the general interest of the time to import useful plants that could drive economic wealth. Both jute and dunchi fiber, which could be used for rope and cordage were found within the collection. The packets also provide evidence that the plantings at The Woodlands were not without garden flowers, some which we now consider common (e.g. morning glories, marigold, zinnia, larkspur and yarrow); and some medicinal plants (e.g. euphorbia, monks rhubarb, nightshade and jimsonweed). The packets also included a number of garden vegetables, some of which would have been quite uncommon in the U.S. at the time, including seeds from two varieties of guava (which had to have winter shelter in a greenhouse), Thai basil, eggplant, several melons, and multiple varieties of cabbage. Image courtesy of The Academy of Natural Sciences of Drexel University. Known today as the Hydrangea macrophylla, this plant is a garden favorite. The flowers can be pink or blue depending on the alkalinity of the soils they are grown in. Illustration published by Curtis in London in 1799. This is the same variety of blue hydrangea that we know and love today, but was then a very rare shrub, sent to the UK from China around 1790, only a few years before Hamilton acquired it. Hamilton was very probably the first to introduce this plant to North America. In a letter written the summer of 1800, William Bartram mentions the new hydrangea in bloom at The Woodlands, describing the “Cœlestial blue of the flowers” as “Inexpressebly pleasing.” Fry notes that Hydrangea was a newly named plant genus that had only recently been discovered in the 18th century. In fact, John Bartram may have been the first to scientifically record a hydrangea in eastern North America when he discovered Hydrangea arborescens, the American wild hydrangea. Hydrangea quercifolia, a.k.a. oakleaf hydrangea, also inscribed by William Hamilton, includes the note “Bartram’s Travels” at the bottom. William Bartram’s illustration of Hydrangea quercifolia, engraved for the first edition of Travels, Philadelphia: 1791. Image from the collections of the John Bartram Association. William Bartram named the species Hydrangea quercifolia and included an illustration in his book Travels, published in Philadelphia in 1791. The plant’s inclusion in The Woodlands collection is interesting; though oakleaf hydrangea is now a common household and garden shrub, at the time it was a very rare plant in gardens. When William Bartram illustrated and named the new hydrangea, he probably did not have a live example at Bartram’s Garden. Only in March 1791 did the French botanist and traveler André Michaux send live plants of oakleaf hydrangea from his South Carolina garden to the Bartrams in Philadelphia. It is likely that Hamilton’s plant also came from French botanist Michaux or from the Bartram plants shipped by Michaux. This plant, a sensitive joint-vetch, was once a common native of the fresh-water tidal marshes of the lower Schuylkill and Delaware Rivers, though it had been virtually eradicated in Pennsylvania and today can only be found in a few protected marshes in southern New Jersey. William Bartram was aware that this was a rare species and had discussed it letters, noting that it had formerly grown in marshes along the Schuylkill with wild rice and other wetland species. Hamilton’s note is of particular interest in this case, since it seems to indicate that the seeds were collected by George Hilton, Hamilton’s African American gardener who was sent to southern New Jersey to collect them, precisely the place where the plant can still be found. There is some evidence that William Hamilton also sent George Hilton on a collecting trip to the southwest corner of Pennsylvania to collect new native plants. Shortly following the discovery of the seed packets, Fry and his colleague Robert M. Peck, Senior Fellow of The Academy of Natural Sciences co-authored an article detailing the discovery of the collection of seed packets and its significance. Though submitted for review, the article has yet to be published, perhaps in part due to the general lack of appreciation and understanding of Hamilton’s contributions to early U.S. botanical study. They plan to persevere and re-submit to a different publication in the near future. The collection of seed packets is now safely housed in the rodent-free herbarium at the Academy of Natural Sciences of Drexel University, which is probably for the best, though we should pause and appreciate the critters in the attic of The Woodlands for their assistance in making a major historical discovery, which without their hoarding antics might never be known. Want to save your seeds like an 18th century botanist? Follow these instructions and channel William Hamilton and William Bartram! This blog series is made possible by Penn Sustainability and PennDesign. Picturing the banks of the tidal Schuylkill as a lush, pastoral landscape takes a bit of imagination these days. But long before it was home to manufacturing plants and oil refineries, the stretch of the River running through Philadelphia to the Delaware was considered one of the most beautiful scenic landscapes in the country. Though much of this revered landscape was lost as the waterfront industrialized, some vestiges were spared. The Woodlands and Bartram’s Garden were both prominent 18th century estates and hubs for the early study of botany and horticulture, separated by just over a mile along the Lower Schuylkill. Safeguarded by early preservation efforts, both are now recognized as National Historic Landmarks, bastions of Philadelphia’s horticultural legacy that live on as parks, historic sites, and important community anchors in their respective neighborhoods. The Woodlands and Bartram’s share a number of historical themes and connections, which we will be exploring in monthly blog posts. This month, we’ll begin by introducing two key players: William Bartram (1739-1823), son of John Bartram and William Hamilton of The Woodlands (1745-1813). The two men were friends and contemporaries (and, notably, both were both lifelong bachelors) passionate about botany and horticulture in distinct yet complimentary ways. William Bartram, son of John Bartram (1699-1777), was a gifted naturalist and a very skilled botanical and ornithological artist. Growing up, he accompanied his father on many of his travels and gradually took over the maintenance of the family garden. Later, William spent the years 1773-1776 traveling the southern Colonies studying and collecting plants and animals. He interacted with local Native American tribes and made copious notes and drawings, writing extensively about his findings which were published as Bartram’s Travels in Philadelphia in 1791. Upon returning from his excursion in 1777, William resumed his work maintaining and caring for the family garden and business at Bartram’s with his younger brother John, Jr.
Just up the river, William Hamilton (grandson of prominent Philadelphia lawyer Andrew Hamilton, whose defense of John Peter Zenger established freedom of the press) established his estate, The Woodlands, in the style of an English country house. Hamilton inherited the estate from his father in 1747 when he was just two years old and had, over the course of his adult life, parceled together roughly 500 acres along the western bank, including much of what is now the campuses of Penn and Drexel. Hamilton was an Anglophile and an enthusiastic amateur botanist and plant collector. An extended visit to England in the mid-1780s inspired the neoclassical remodel of his Philadelphia estate, recognized as the earliest example of Federal architecture in the country, and heavily influenced his approach to landscape design. Thomas Jefferson, who was a frequent visitor to both Bartram’s Garden and The Woodlands, once remarked that Hamilton’s estate was “the only rival which I have known in America to what may be seen in England.” Hamilton was particularly interested in collecting rare and exotic plants, introducing a number of exotic species to the U.S. through his massive greenhouse complex which is believed to have housed upwards of 9,000 species. The Woodlands and Bartram’s Garden formed the nexus of the country’s early botany scene and helped spur a regional horticultural economy that persisted for generations. Prominent naturalists, politicians, and members of the gentry would often stop at one or both gardens when travelling into the city. The two Williams frequently connected over their shared interest in plants and botany, often exchanging letters, plants, seeds and services. This relationship is best illustrated in their correspondence, which was frequent and familiar and often involved arranging the viewing, sharing, and trading of plant material. I must beg the favor of you to make a sketch of the Senecio nova, floribunda as it now blooms in my Hot House. For this obligation I will make you any compensation in my power. After this day it cannot be done this Season as its beauty is already on the decline. I have moreover in my Hands at this moment, just arrived from England near 100 coloured plates mostly of new plants (some of them from Botany Bay) which you ought not to lose the opportunity of viewing & they are immediately to be return’d to the gentleman who left them here. I hope therefore you will oblige yourself as well as me by coming here as soon as you can after receiving this & that you will come prepared to make the sketch I have required, in which I am more interested for the Honor of American gardening than you are aware of. I have seen a figure & description of this plant as it flower’d last season for the first time in Europe, under the name of Senecio Chrysanthemum by which I find it flower’d with me before it was known in Europe. Your friend & humble Servt. William Hamilton to William Bartram, November 7, 1796, Gray Herbarium Autographs 3:17a, Harvard University. William Bartram to Benjamin Smith Barton, July 16, 1800, Barton Delafield Collection, American Philosophical Society. William Hamilton to William Bartram, circa 1803-1805, Bartram Papers 4:49b, Historical Society of Pennsylvania.